You would think that adults would grow up and grow out of puberty, but if you watch them playing with their cell phone, you might reach a different conclusion. I observed a mother and teenage daughter at a café. The mother was obsessed with her cell phone and no matter what the daughter did, she couldn’t get any contact. The daughter finally gave up, looked out into space with a sad look on her face. The mother was bound, but the two were unbonded. Cats are always where they’re at. One reason is that they don’t carry cell phones. I thought that I would share with you, wherever you are, a thought that I received in a rejection letter from St. Martin’s Press on my novel “John, Waldo and Henrietta.” In the letter I was informed by the editors that “we both felt that your style was very Joycian, and while your writing is good, it would have to be great to make it the kind of success we would both want.” So if you can get on a Ouija board, I would like to share some thoughts with you since we have similar styles. If you have access to Internet where you are, you can access the first chapter of my novel at drewrodgers.com and I would appreciate it if you could share your thoughts. If you are wondering what this has to do with the cat focus of this blog, Waldo and Henrietta are cats. You probably have not thought of cats as a replacement for kids, but then you haven’t seen my You Tube video, which you can now. Don’t get me wrong. I am not trying to change your family plans or solve the world’s population problem, just give you a chuckle. So fasten your seat belt, turn on your sense of humor and off we go on a journey into a new world of parenting. 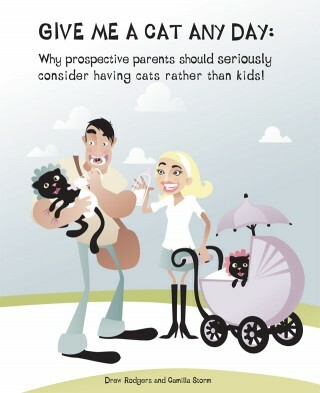 If you think it’s better to have kids rather than cats, then we have to talk. I have 50 indisputable reasons in favor of having cats in a new book “Give Me a Cat Any Day: Why Prospective Parents Should Seriously Consider Having Cats Rather Than Kids.” You’ll get to see the other 30 when I find a publisher. If you happen to know of one please let me know at drew.rodgers43@gmail.com. Parents’ role is rapidly changing from parenting to being service providers. 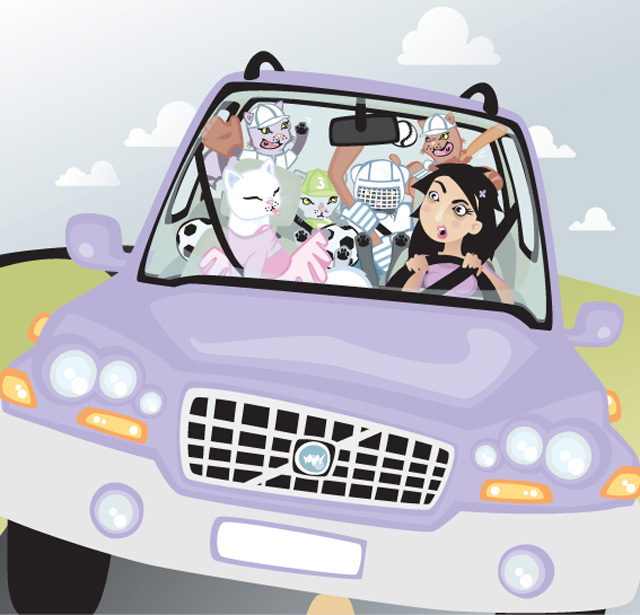 Rumor has it that some parents spend so much time driving that they are applying for a Teamsters’ card. Due to the activity mania families are spending more time on the road to various training than being a family. If you have to have kids and not just cats, here is a piece of advice. Wouldn’t spending quality time with family and naturally with your cat be more soul assuaging? Check out a cat’s activity schedule for a little perspective. Stay tuned for new reasons coming soon. Give Me A Cat Any Day. Click on the picture to have a look. Forty-six (and counting—if you have any suggestions, please share them with us) captivatingly illustrated reasons for having cats rather than kids, accompanied by endearing cat sayings that will warm the hearts of DISCs (Dual income some cats) and BCAKs (Both cats and kids). A perfect gift for any and all cat lovers. Self-publishing which will involve finding an agent to handle marketing, sales and distribution in our target markets, North America and the UK. Finding a publisher. The other commercial potentials in addition to the book are cards and calendars. In the meantime, the illustrations for “Give Me a Cat….” will be available on a pay per illustration basis Please contact us if you are interested.